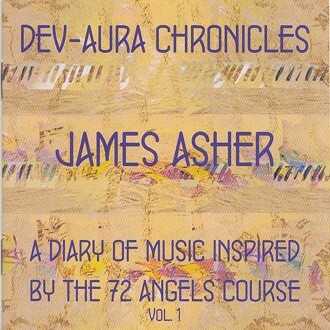 Dev-Aura Musical Chronicles – A Diary of Music Inspired by the 72 Angels Course Vol.1. The courses at the Academy, Tetford, Lincolnshire held in February 2010 with the title “72 Angels of the Kabbalah and Aura-Soma” provided a powerful catalyst for James Asher to write two new albums of original music. The unique blend of harmony, energies and light presence at Dev-Aura have for many years represented a very fertile environment for James in the creative process, and have been highly encouraging of new music. In 1994 his album Dance of the Light contained a composition Dawn at Dev-Aura, which combines the sounds of the dawn chorus with inspirational music written there on a glorious midsummer morning. The nature of the 72 Angles course combined with the engaging qualities of those people attending it created a scintillating ambience, within which these new light filled compositions flowed effortlessly. Written in the morning before the teachings of the day began, the music become imbued with the focused spiritual intent of the people attending attuning in their own way to what lay ahead. These inspirational pieces of music were recorded live into a keyboard at the time, and then the data transcribed at a later stage in the studio, where the original information was expanded by an additional range of sounds and virtual instruments. The resulting music has an ethereal expansive quality, providing an ideal accompaniment to the following:- Yoga, relaxation and meditation, massage, healing, attuning to your personal colours for the day or just chilling out at the end of the day.